If you cook a lot like I do, especially sauces, or in the case of my wife, mac and cheese,Â I’m always trying to figure out what to do with my stirring spoon.Â Yes, yes, I have multiple spoon rests, but I never seem to use them, probably because they are usually on the drying rack and that is at least 2 to 3 steps away from the stove top that I’m hovering over! I usually just try to balance the wooden spoon (my spoon of choice) over the top of the pot, carefully adjusting it so the end of it does not hang over the pot and run down the outside of the pot, making a mess for my wife to clean up later. That works well, at least until I accidentally hit the pot handle and the spoon goes flying across the stove. This morning, while drinking my coffee, reading e-mail and surfing the Internet,Â I discovered a littleÂ gadget (and how men love gadgets!) 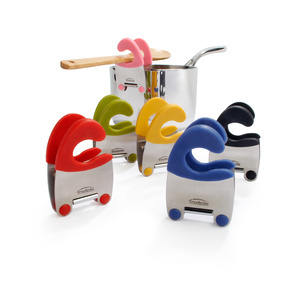 that clips on the side of the pot.Â This clip allows the spoon to stay safely over the center of the pot.Â I’m guessing it may even keep the spoon from flying across the stove if/when I hit the pot handle?Â Â I can’t wait to give one of these a try! 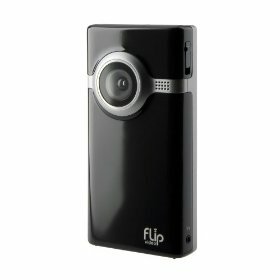 Have you heard of the Flip Video recorder? The last player, the Mino (pronounced â€˜minnowâ€™) is pretty amazing for the price. It has a viewing screen that is 1.5″ (diagonal), the record quality (resolution) is 640 x 480, which is VGA quality and while not HD by any means, it is great internet quality. Most YouTube videos have a smaller resolution size than 640 x 480. The frame rate is 30 frames per second and storage is 2 gigabytes, which is estimated to give about 60 minutes of record time. On-line sharing includes unlimited private video emails or video greeting cards, direct upload to MySpace, YouTube, or AOL. It will also take still photos. It works with PCs and Macs and connects using a built in USB port. See the full set of the specifications. Why would I want one if I already have a video camera? (and you know I do because of all of the Caden videos!) I donâ€™t always have the video camera with me, but this is so small I could keep it with me when and always be able to capture the funny stuff that we sometimes miss. One added bonus is the cover of the Mino can be customized. It has has to be ordered through their web site for this option. Amazon’s current price is around $153, purchase it from Amazon. Almost a month ago, Caden got his first haircut. I tried to hold off until after Halloween, but Jennifer wouldn’t have any of that. Of course the video camera went with us. David Berry, who has cut my hair since I’ve lived in Ruston cut Caden’s hair.Â I’ve never seen David move so fast! The whole haircut was only about 7 or so minutes, but don’t worry, for the video, I sped it up to double time, so the entire video is around 4 minutes.